While in many ways I'm over planning and preparing for our wedding, this is far from the time to sit back and just stop caring about all of the details. We've put many many hours (and dollars) into making this day happen, and the things left to be done at the end will make or break how the day goes. I'm talking about timelines and the logistics. There are a lot of moving parts that go into making a wedding day happen, and when you're running the show on your own property, there are many more pieces of the puzzle you need to think about in order for the day to go smoothly. Over the last couple of weeks I've been putting together some extensively detailed timelines in order for everyone to know when and where things are happening. There are a lot of things going down next week. Hair appointments, nail appointments, rental arrivals, invoice settling, flower picking, vendor visits, guests arrivals, set-up, final preparations. It's madness people. MADNESS. The schedule for next week helps me breathe knowing it's all doable. I'm so excited! It's going to be nutty but so much fun. There is a stark contrast between the boys and girls day. The boys have four hours of free time, and the girls jump right into appointments. I'm so excited for spending the day with my favourite people getting ready anticipating everything to come. Having a solid schedule in place helps everyone know when and where we need to be and helps me relax a little. I know things don't always go according to plan, but when things get off track we will know where we can speed up the process in other areas to make up for the timing. 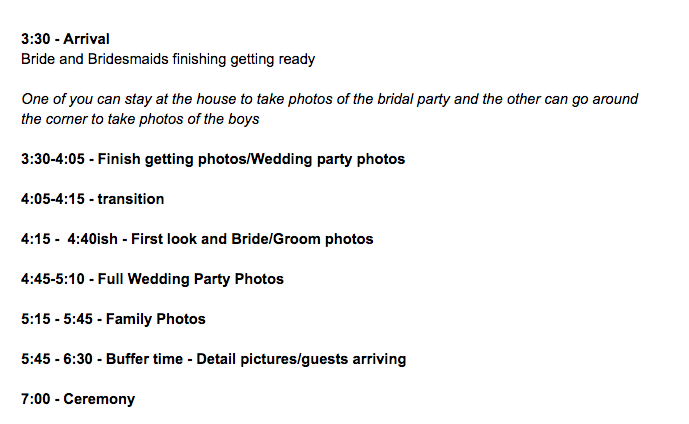 We sent our photographers a detailed timeline including the order of photos before the ceremony, the ceremony details and wedding reception timelines. 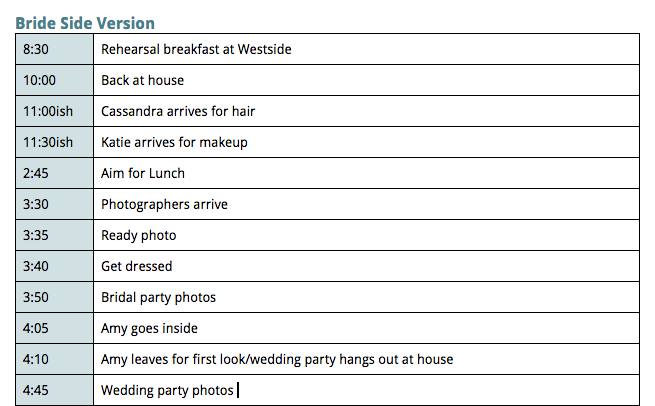 We also gave them a list of the photos that are important for us to capture during the day. 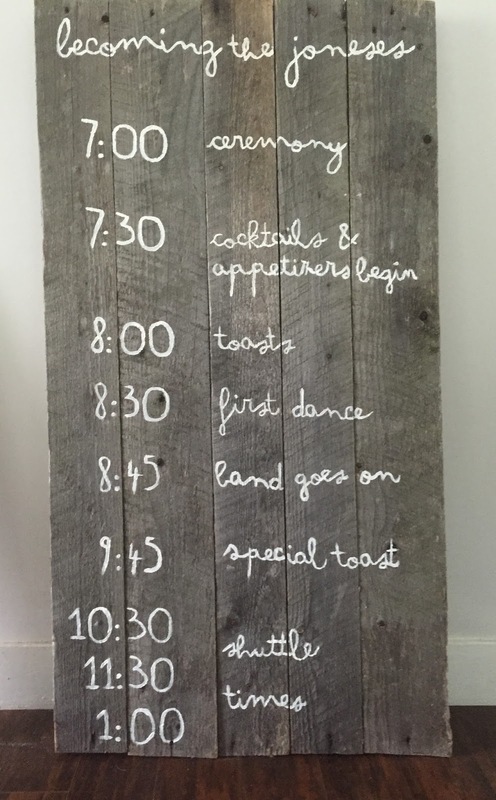 This is the same for the entire wedding party, a breakdown of the ceremony, speech order, dances and the remainder of the evening. A good friend of MOH Cass accepted our offer for her to act as our day of coordinator. She has tons of experience in the wedding world, and I already know she is going to be our saving grace for the day. I have a detailed list of the things I'd like for her to take care of, timelines of when vendors arrive and other general logistics so she can become the keeper of all wedding knowledge. What were the important details in your final week of logistics and day of scheduling? *Note: There will be plenty of snacks available between breakfast and their late lunch as well, it's a just a reminder for us to have a meal of sorts since the food doesn't come out until 7:30 in the evening.